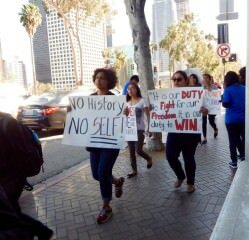 Students protest Tuesday outside LAUSD headquarters to get ethnic studies classes. 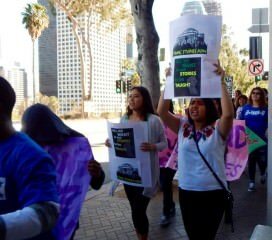 Although an ethnic studies mandate was approved by the school board in 2014, LA Unified is only now taking steps to fulfill their hope of getting ethnic studies into every high school. But it won’t be a graduation requirement any time soon, and it won’t be a requirement for the class of 2019, as the school board voted on two years ago. Outside the school board meeting Tuesday, about 300 students, parents and teachers circled the Beaudry headquarters with signs and shouting slogans to include ethnic studies in their curriculum. 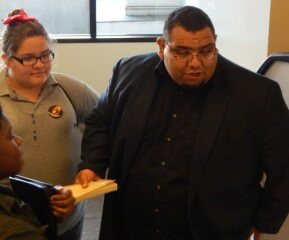 Jose Lara, founder of the Ethnic Studies Now Coalition, spoke at Tuesday’s school board meeting along with Dominguez and a few other students to ask the district to honor their own resolution. Superintendent Michelle King then announced that in March the University of California Office of President approved a one-semester ethnic studies class that will fulfill a college-prep curriculum class. It will be available to all high school students by the fall. “That’s a good mark forward,” said King. Then she added that by May 1 there will be on the district website a course outline of the class, and eventually there will be six other classes in the ethnic studies curriculum. The classes will include studies on identity and focus on four historically marginalized groups in the United States: African Americans, Latino Americans, Asian Americans and Native Americans. They will also include LGBT issues. The board passed the resolution in October 2014, but in May 2015 then-Superintendent Ramon Cortines said he didn’t support making ethnic studies a graduation requirement. Cortines said such studies should be included in the curriculum in classes earlier than high school. He was also discouraged by the multimillion-dollar cost of expanding the ethnic studies program. Chau said he is working toward creating courses such as African American History and Mexican American Literature so they can become another element of a coordinated ethnic studies program. Already 40 of the 98 high schools in the district offer some kind of ethnic studies course as an elective, and Chau said that he hopes to expand it as an elective into middle schools. Along with the basic ethnic studies class, there are three history and social studies courses and three English language arts courses involving the studies. Students marching outside the school board headquarters. She said a fully integrated ethnic studies class in high school would have given her the support she needed to get to higher education, and she believes that some of her fellow classmates in high school would have joined her in college if they had such a class. King’s plan to renew an emphasis on ethnic studies is a start, she said. Lara said he met with most of the board members and they individually support the idea, but he said the ball was dropped after former board member Bennett Kayser was voted out of office last year. “The Ethnic Studies Committee needs to be re-formed too,” Lara said. Chau said he still consults with the members of the Ethnic Studies Committee, but said their proposals are in, and they pointed out the cost will be in the millions of dollars for retraining teachers and perhaps hiring more teachers. He is already starting professional development for teachers interested in teaching the classes. And by next fall the ethnic studies classes will be available at all high schools. It will be up to individual school principals to decide if they want to bring it to their schools, Chau said.